Do you like vegetables wrapped up in a soft rice roll? 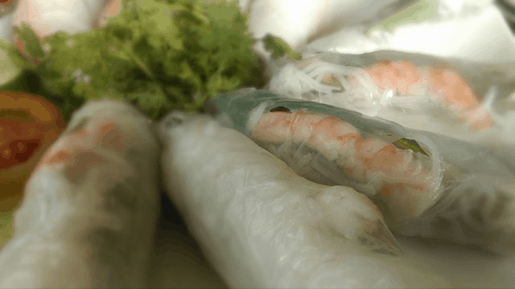 Well, these soft rice rolls will have your stomach thanking you and your taste buds excited after your first bite of these. This quick and easy recipe will give you a mixture of vegetables in about ten simple minutes. Just remember to get the ingredients chopped up and ready to go before you wet the rice paper or keep damp cloths to keep the rice paper from drying out too quickly. With fresh veggies like bean sprouts, potatoes, carrots, and cucumbers, can assure you have a delicious way to have a warm and healthy meal, which fill you up. It makes 4-8 servings, but you can easily modify it to allow for more if you are hosting a party with friends and family. In addition, since it is quick you can always make another batch quickly if you have unexpected guests or are just hungrier than you thought. For those that do not work with rice paper very often, you should be careful as it tends to be sticky and should be used on a clean surface. Patience is key here. Other than that, it does go well with soup or sauce of choice; it is also good on its own. Boil water in a pan and pour into a bowl. Dump the rice paper in hot water until soft. Take another bowl and mix all the listed ingredients in it. Next step is to fill out the wrapper with a generous amount of mixture. Serve this recipe with a sauce of your own choice.